Norwalk, CT – January 18, 2019 – MediaWorks 360 is proud to announce the launch of DISH, a new premium membership program for food and wine enthusiasts brought to you by The Culinary Institute of America, the world’s premier culinary college. MediaWorks 360, who develops and manages membership programs, recognized that the rich content, recipes, video and experiential assets of the CIA would make strong benefits for a robust membership program. Foodies worldwide can now experience The Culinary Institute of America through DISH. MediaWorks 360 worked with The Culinary Institute of America’s team and the membership platform experts, Fullcube, Inc. to develop and build one of the most exciting programs in the food & wine category. Audience Development: Drive growth and create savings by supplementing or outsourcing circulation, newsstand or data. Whether it’s growing your audience through email, direct mail, social, 3rd party partners, expire or retail marketing, we have the solutions you need. Premium Price Memberships: Generate new, organic revenue streams by bundling assets to build unique, premium-priced subscription programs for enthusiasts. We bring the experience, expertise and platform, you bring the brand. Database Management: We optimize subscription revenue by leveraging scoring algorithms, test matrices and marketing know-how. Individualized pricing and real-time data help us enhance the acquisition funnel and customize each customer’s journey more effectively and less expensive than other data companies. MediaWorks 360 is proud to have worked with This Old House in launching their new Insider Membership Program. This premium-priced program drives new revenue and enhances the engagement of their most passionate consumers. The This Old House Insider digital-subscription membership program launched in February and gives access to two-plus decades from its extensive library of television content, print content and offers invitations to members-only events with the award-winning TV experts. Additional benefits include exclusive discounts and deals to help home renovators at all stages, of all ages, wherever they are. Brands work hard to develop new products to connect with their enthusiast base; video, mobile and web-based content, experiential, e-learning classes, and years of digitized archives to name a few. These brands are trying to use these “assets” to build a deeper relationship with their customers but too often are marketed in a silo. If your brand wants to become, or remain the most sought after source in the category, why not build an uber-customer by bundling all of your platforms into a single, premium-priced membership program? Ultimately, these programs can become the top of a strategic consumer hierarchy. Lead off by marketing to your strongest customers with the “best” your brand has to offer and move down the hierarchy to it’s lowest engaged customer (the free newsletter). 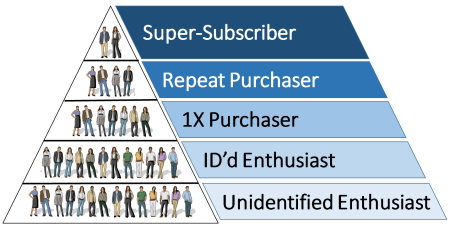 Adopting this hierarchy allows for the logical marketing of multiple bundles with varying benefits and price points, while giving your consumer a seamless and quality user experience. The benefits created by leveraging this membership strategy will create organic revenue growth, maximize your marketing ROI, consumer engagement and deliver some of the most exciting opportunities to come along in consumer marketing in years. The current business environment has many companies scrambling to reduce costs while simultaneously expanding to new platforms to stay in touch with their audiences. Many brands have worked hard to develop new products to connect with their enthusiast base; video, mobile and web-based content, experiential (very hot right now), e-learning classes, and years of digitized archives to name a few. Those brands are trying to use these “assets” to build a deeper consumer relationships but are missing an opportunity in their deployment. Too often, we see that each new brand platform is marketed in a silo (SVOD) or maybe bundled with one other product (i.e., the print and digital subscription bundle). If your brand wants to become, or remain the most sought after source in the category, why not build an uber-customer by bundling all of your platforms into a single, high-priced subscription program? By bundling these new assets into a single program you create new, organic revenue streams through an enhanced subscription offering. This opens that elusive door to a paywall strategy for content and services. The program strengthens the relationship with your core enthusiast – your best customers. Improved engagement and longer retention are natural benefits. You also increase the wallet-share within your category. A private marketplace is built whereby you connect key advertisers with your core enthusiasts. Deals, discounts and additional content allow customers to more deeply engage in their passion. Ultimately, this program can become the top of a strategic consumer hierarchy. Lead off by marketing to your strongest customers with the “best” your brand has to offer and move down the hierarchy to it’s lowest engaged customer (the free newsletter). This hierarchy allows for the logical marketing of multiple bundles with varying benefits and price points, while giving your consumer a seamless and quality user experience. The benefits created by leveraging this type of strategy will maximize your marketing ROI, consumer engagement and deliver some of the most exciting opportunities to come along in consumer marketing in years. Norwalk, CT – October 20, 2016 – MediaWorks 360 announced today that they will expanding their consulting relationship to provide The Taunton Press, the premier, multi-channel media company, producer of Fine Woodworking, Fine Homebuilding, Fine Gardening, Fine Cooking and Threads with senior management of their book publishing business. Legacy Cost Reductions: Our expertise can help reduce legacy costs company-wide from subscription & newsstand marketing to pre-press, production and digital services. Audience Development: Discover the power of bundling a brand’s assets to build unique, premium-priced subscription programs. Many publishers have assets siloed in print, digital, experiential, archives, etc., but few have bundled them to generate a new, organic revenue stream. We have the expertise and the platform. Transformative Content Expertise & Tools: Multi-platform content strategy allowing companies to effectively “create once-publish anywhere”, with an emphasis on digital-first. Our program drives savings by simplifying the workflow and providing a system to support it. Founded in 1975 as The Taunton Press, Taunton Inc. provides high-quality information and inspiration to special-interest enthusiast and professional craftspeople in the woodworking, home building, cooking, gardening, and crafts markets. Taunton, Inc. is renowned for its high-quality content and relies on the support of its readers for its business success. Taunton, Inc. publishes magazines, books, websites and provides digital products and services to enhance the skill levels of enthusiasts in each of its markets. Its leading brands include Fine Woodworking, Fine Homebuilding, Fine Cooking, Fine Gardening, Threads and GreenBuildingAdvisor.com. Taunton, Inc. is an independent, family-owned company. Norwalk, CT – MediaWorks 360 has announced that Dave Ball will be joining the company. Dave has over 30 years of experience as a consumer marketer in the print and digital world. He has worked in both the consumer and B2B space, as well as market research. Dave has held senior executive positions with top media brands and has hands-on experience with both online/offline media and e-commerce. Prior to his joining MediaWorks 360, Ball was Senior Vice President of Meredith Corporation where he oversaw subscription marketing for some of the largest magazines in the country. During his tenure at Meredith, he managed a number of product launches for the company and led development initiatives for digital editions; growing online subscription sales exponentially. Previously, Ball was responsible for circulation marketing of over 100 brands at Primedia Special Interest Magazines, overseeing the acquisition of over 50 titles while leading the development of Primedia’s consumer database. MediaWorks 360 is a media solutions company that guides organizations through the intersection of old and new media by providing solutions for consumer brands. Norwalk, CT – July 17, 2015 – MediaWorks 360 announced today its agreement to provide ongoing newsstand consulting services to The Taunton Press, the premier, multi-channel media company, producer of Fine Woodworking, Fine Homebuilding, Fine Gardening, Fine Cooking and Threads. Assuming responsibility for the sales and marketing of Taunton’s brands at retailers and newsstands across the country. Working with Taunton’s content teams and the retail distribution channel, MediaWorks 360 will help to bring their best products to market. Exploring premium-priced subscription affinity programs - well suited for Taunton’s vertical, enthusiast brands. Evaluating content workflow and systems to offer best practices, as Taunton fully transforms into a multi-platform content provider. Legacy cost solutions such as subscription & retail marketing and multiple production services allows companies to reduce costs, while supporting investment in growth initiatives. Taunton, Inc., is a multi-channel media company that provides high-quality information and inspiration to special interest enthusiasts and professional craftspeople.